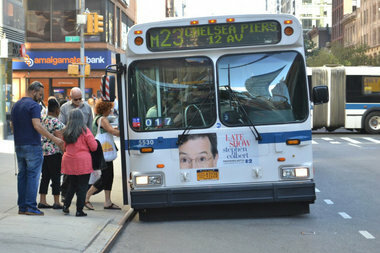 The M23 select bus service crosses Manhattan at 23rd Street. CHELSEA — Bus riders shuttling across 23rd Street on the M23 may be in line for an upgrade, as the city revealed plans are in the works for a new Select Bus Service along the bustling street. As part of the process, the city's Department of Transportation is asking for riders' feedback to identify trouble spots, traffic snarls and schedule blips along the bus's path. The department hopes the feedback will help them streamline the "speed and reliability of the service while improving the safety and operation of the street," a DOT spokeswoman said. They launched a feedback portal where you can map out your grievances this month. @MTA M23 WESTBOUND? Where is Bus & Driver? At 1st & 23rd street - NO WEST M23 for 25 minutes? GET M23 OVER HERE RIGHT AWAY.